As you can see above, our small Christmas cactus is blooming right on schedule. 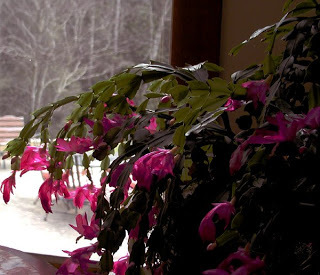 Our large Christmas cactus is confused by the mild weather, thinking that winter is not quite here yet. We think we saw one bud peeking out, so we’re hoping the big guy blooms within the next couple of weeks. We’d like to take the opportunity to wish our friends and guests a very Merry Christmas and Happy Holidays from the Inn on Mill Creek. We hope everyone has a safe and happy holiday weekend!